The project aims to develop a new wearable, sensors technology to be integrated into the existing Aqua Running bodysuit, in order to retrieve physiological data of the patient’s recovery and monitor exercises. This unique bodysuit allows anyone of any age, ability or disability to exercise comfortably in deep water with no impact on bones, joints and muscles. 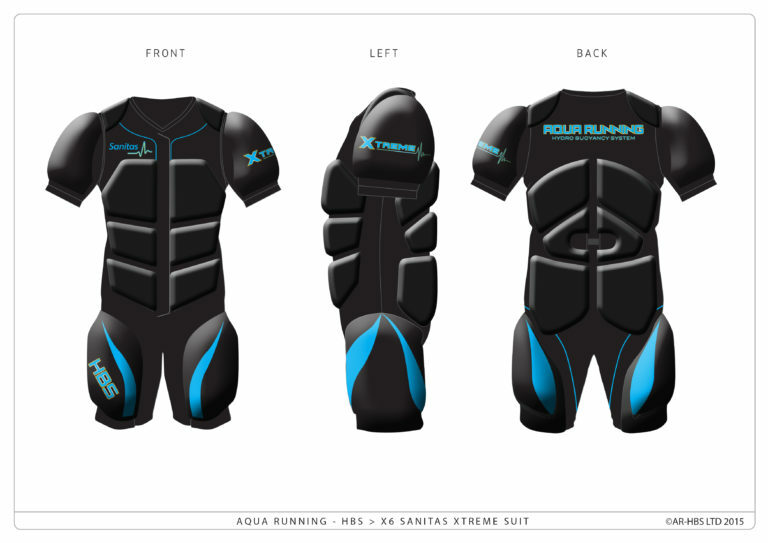 The Aqua Running X6 suit is a buoyancy suit with 19 strategically placed buoyancy pads, which keep a person’s head above water and activates core muscles to help correct running and jogging position in the water. This allows the wearer to exercise safely and with no risk of injury very early in the recovery from surgery, illness or injury, in turn reducing recovery and rehabilitation time significantly. 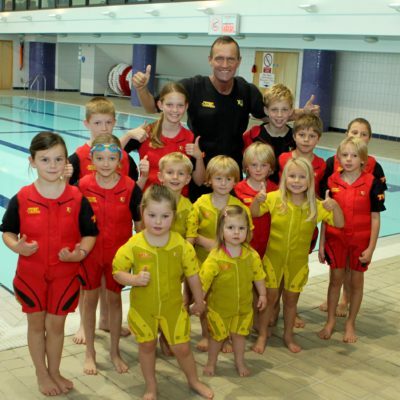 It is also an excellent aid for those learning how to swim, while parents can be confident about the safety of their children whilst in the water. A former midfield player with Liverpool FC, Terry was forced to retire from the game due to repetitive injury. He began a career as a Paratrooper but soon learnt that he would face death within 6 months due to kidney failure unless he had an urgent transplant. He was forced onto Kidney Dialysis for 2.5 years until his brother, Dean, donated one of his kidneys in 1988. To repay Dean, he decided to become the fittest Transplant patient in the World. 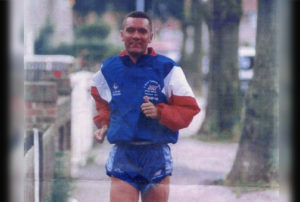 Only 15 months after the Transplant, he ran the London Marathon and raises £500.00 for Kidney Research, won 3 Gold Medals at the 1992 British Transplant Games and was selected to run for Great Britain at the World Transplant Games in Canada in 1993. 12 months later and only 6 weeks before the World Championship, Terry was told his Transplant was failing. He refused to accept his running dream was over and started Aqua Running in the pool with a flotation belt. Today, he is the founder and Managing Director of Aqua Running International. Jescuba is one of the most professional surfing and diving apparatus manufacturers and traders in China. They produce and sell wetsuits, rash guards, gloves, boots as well as other stuff for surfing and diving. Jescuba has customers in USA, Europe, South America and Australia. My name is Terry Nelson, I am a former Footballer with Liverpool FC Paratrooper and World champion runner. I developed the unique Aqua Running X6 Bodysuit after trying to keep fit and exercise through many years of serious illness and disability. I’m developing a completely new sensor technology to be integrated into the X6 suit, which will retrieve accurate physiological data from the patient or injured person, and to assist medical and coaching teams to rehabilitate more quickly. The suit and Sensor technology are set to revolutionise the world of medical rehabilitation and sports performance. How does the Aqua Running bodysuit work? People who are very ill, suffering from severe physical challenges and recovering from surgery and injury, have great difficulty exercising in their rehabilitation. Aqua Running Bodysuit aims to solve this problem. Exercise is known to have a massive impact on health and wellbeing both physically and psychologically. Due to impact forces on fragile and recovering bodies, exercise can be very difficult and can lead to a cycle of depression and longer recovery times. The Aqua Running X6 suit instantly takes away 90% of a person’s body weight due to the high buoyancy body pads in the suit. A person weighing 150 kilos only weighs 15 kilos in the suit and so can exercise very comfortably without any damage to bones, muscles and joints. Terry’s 30-year-long battle to stay fit whilst suffering serious illness made him aware of the challenges people recovering from illness and injury face. Sensors added to the revolutionary Aqua Running suit will retrieve accurate physiological data for medical teams. The main strengths of my partnership with the manufacturer is that I can control development of my designs, while a major challenge for me is communication issues with my Chinese factory, it can sometimes take time for my ideas to be implemented correctly. Together, we feel that our Aqua Running Bodysuit is not only a revolutionary suit that will help to change lives around the world by enhancing recovery and fitness, it is also a Beautiful Idea. To bring the Sensor Technology to life will mean collaborations with top scientists in Sensor Technology to develop the particular benefits we want to see for our clients and customers. The development will link our bodysuit with the Sensors into a manufacturing process including prototypes leading to a finished commercial product. People from all around the world face the same physical challenges, we believe we have found an answer to some of those challenges. My greatest achievement would be for my suit with sensor technology to change millions of lives a by allowing anyone with any illness or disability to be able to exercise and get the massive physical and psychological benefits exercise brings in their recovery. Also, I expect to revolutionise sports performance training and rehabilitation with my unique suit and world leading sensor technology. The main challenge is that I am developing completely new sensors which retrieve accurate physiological data through water. The water is the real technical challenge as it disrupts accurate data retrieval. I hope we can develop a positive collaboration with OpenMaker, by exchanging innovative ideas with different people and companies. We have a policy of Continuous Innovation whereby we are constantly looking to upgrade and further develop our products. This will also help us to stay ahead of our competition and remain leaders in the field. As an award winning disabled business man, it is my specific objective to employ people with physical challenges or disabilities to work in the company and also to eventually manufacture our bodysuit in Liverpool utilising the skills of the disabled workforce. "The trials and tribulations of hearing loss"
As I’m very hard of hearing with hearing aids, I’ve have difficulties training people in the suit sometimes. 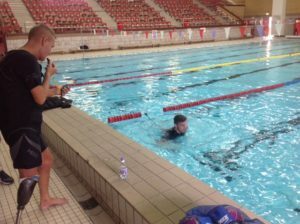 I went to Manchester United to train in the pool Ryan Giggs and another player, which I presumed to be Spanish. I was continually shouting “Well Done Ryan", “Well Done Armando”, “Work hard Ryan”, “Work hard Armando" for 40 minutes. At the end of the session, the players thanked me and Armando said in a thick Manchester accent: "My name is Keith.” None of the coaches watching said a word, they just let me carry on and thought it was hilarious!